eighth blackbird has consistently drawn praise for its performance of Slide. “The blackbirds brought their irresistible élan,” reports the Los Angeles Times; the work was “brilliantly played by the blackbirds,” affirms Musical America; “eighth blackbird navigated Mr. Mackey’s score without blinking, while also playing roles,” elaborates the Santa Barbara News-Press. Moreover, Slide was, from the outset, an eighth blackbird project. The sextet was instrumental in bringing together the creative and artistic team behind it, participating in the creative process, and presiding over the whole production, including the recording. The six musicians worked in close collaboration with composer, electric guitarist, and Guggenheim fellow Steve Mackey and 2007 Pulitzer Prize-nominated writer, actor, and singer Rinde Eckert, both of whom join the ensemble on the new album. The resulting work is a dish for musical omnivores, part song cycle, part rock opera. While the ingredients are finely diced and there are no actual quotations, the songs are seasoned with homages to composers as diverse as Dowland, Mozart, Stravinsky, Piazzola, and the Beatles. 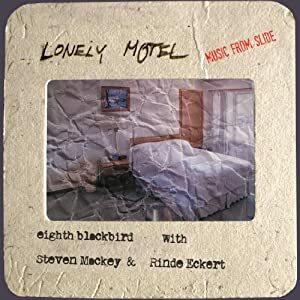 This rich brew reflects the eclecticism both of eighth blackbird, whose members “are without stylistic allegiances: Minimalism, Post-Minimalism, experimentalism, New Romanticism, old Expressionism, rock, smooth jazz, not-so-smooth jazz – all come easily and naturally” (Los Angeles Times), and of Mackey, whose ability to incorporate and transform references to music from Monteverdi to Led Zeppelin is “lithe, subtle, and more than a little playful” (Newsday).